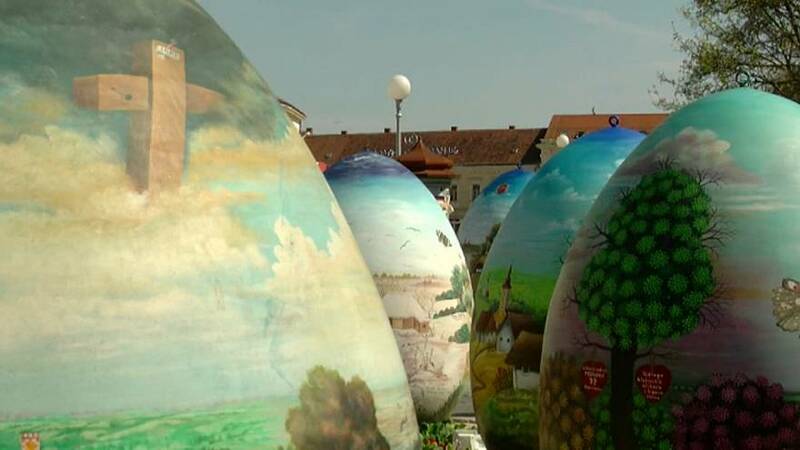 The Croatian town of Koprivnica has unveiled an outdoor exhibition of two-metre-high painted Easter eggs. Painting eggs is an important Easter tradition in the country, with techniques and motifs varying from region to region. The Pisanica Od Srca (Easter Egg From the Heart) exhibition, which has been running for 12 years, is a showcase for the "naive" painting style, depicting rural life in the region of Podravina. Eggs from Koprivnica have become popular across Croatia, as they are sent to numerous towns and cities to be displayed in public areas even making it as far afield as Prague, Brussels, Vienna, New York and Los Angeles in previous years. The Koprivnica Tourist Board say the eggs are sent to represent everyday life in the Podravina region, but also as a sign of friendship, love and joy at Easter. This year, eggs will make their way to Krakow and Warsaw, and in Croatia to Cakovec and the island of Solta. Tourist board deputy director Kristina Socev said: "I will not be modest when I claim that naïve art is something what only we have, it is unique in the world."